Since 1975, Mumbai-based Stree Mukti Sanghatana has helped thousands of women improve their lives and escape poverty. Its concern for a gender-just world has also coincided with a concern for the environment. Parisar Vikas, one of the NGO's key programmes, aims to recycle waste and create zero-waste cities. 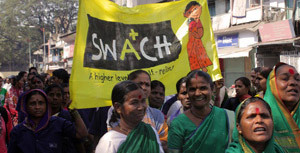 It works closely with self-employed women waste pickers whom it has empowered to resist exploitation. Besides training these women in composting, bio-methanation, micro-saving and leadership skills, the NGO has also helped many women find alternative employment. The organization also runs seven daycare centres for working mothers. Its adolescent sensitization workshops have oriented the youth to gender issues and environmental concerns, and its educational programmes for children hold the promise of opening up new horizons for them. True to its name, Stree Mukti Sanghatana or Women's Liberation Organization, has also set up family counselling centres that have helped hundreds of women heal from violent domestic situations. Among its many efforts to raise awareness has been the immensely popular play Mulgi Zhali Ho (A Girl is Born), which celebrates the girl child and has been performed more than 3,000 times in India and abroad. Currently, the NGO is building an innovative facility in Navi Mumbai that will offer trainings in water recycling, rainwater harvesting, bio-methanation and composting. This centre will be open to anyone interested in learning how to manage, treat and recycle solid waste. It will also house a temporary shelter for distressed women, a working women's hostel, a day-care centre along with an exhibition made completely out of waste and recycled materials. Whether it is making treasure out of waste or standing up for women's rights, Stree Mukti Sanghatana has insisted that no one or nothing must be marginalized.